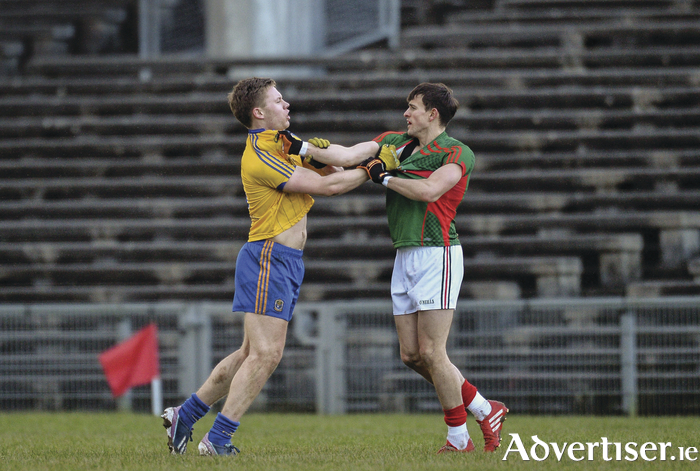 Getting to grips with each other: Mayo's Jason Doherty and Roscommon's Niall Daly tussle in last years FBD League meeting between the sides. Photo: Sportsfile. On Sunday afternoon the FBD really gets serious when Mayo face their first inter-county opponents of the new season when they take on Roscommon in Hyde Park. The action on the sideline will be of as much interest for some observers as what's taking place on the field, with Kevin McStay, the man who wanted the Mayo job in late 2014 and didn't get it, and Stephen Rochford, the man who replaced the duo who got the post over McStay, going face to face. It will also be the meeting of two managers who in the last three years have both guided clubs from Connacht to glory in the All Ireland Senior Club Championship. Both sides come into the game with two wins over the two third level sides in the competition under their belts and the winners of Sunday's encounter will progress to the following weekend's final, giving them an extra game ahead of their national league openers on the last weekend of the month. Rochford is expecting a step up in quality in the terms of the opposition that his side has faced so far this year, saying: "That goes without saying, it’s well known that Roscommon have a good bit of work done, I think maybe they had a challenge match, if not two, played before the new year. They’ve a lot more work done than us, they had a very strong team out and a good scoreline kicked last week. So it will most undoubtably be our toughest challenge are regards quality and the team we’re going to play. But that’s good, I think it will serve us best, if we can preform to a quality level, we may come out with a result if not I think it will serve us well going to Cork two weeks later." As for it being a good thing to win the game, or to just keep seeing an continued improvement in his side ahead of the Cork trip in a fortnight, Rochford said: "To be honest, I haven’t really thought that far ahead, we’ll see what sort of team we can pull together and operate coming towards the weekend, but you can’t beat games either. But you’re weighing that up with the aspect of being able to plan and try things out and probably more specifically for Cork. Look, we’ll probably have a better idea of what that is next Sunday morning regards what level of team we have and where we find ourselves fitness wise, and whether we want the week and whether that would be better. But we’ll be going out to win that game, in that manner we’re looking to get to the final." In 10 weeks' time the sides will meet again the league for the first time in 15 years, and at that stage we will have a much better understanding of how both sides are progressing ahead of the championship in later summer. Rochford has named the same 23 man sqaud for Sunday's game as the one that he had to pick from last weekend with a number of players still unavailable through injury and other commitments, and he will continue to use the competition as a chance to experiment and see how the newer players progress and give more established names a chance to step up to the level. “I think very much the point is you’re experimenting you’re looking to see are there more potions available to you. I think Mark Ronaldson has a nice kicking game there at the moment, there will be bigger challenges for him as we go along. Keith [Higgins] has got his pace and you’re looking at the qualities and the attributes that the players have and you’re trying to fit them in. Other players like Brendan Harrision and David Kenny, young lads coming in, you can only play two corner backs so it was important that Keith got a game today, but you could quite as easily see Keith at corner back the next day, I wouldn’t think that people should read into anything necessiarly, but at the same time it’s giving us options and more food for thought later on in the year to come." As for having plans to drip feed new players and returning players back into the fold on a game by game basis in the league, it's all a matter of taking it a game at a time, says Rochford. "Well yeah, I think you would be a little bit foolish to start planning too far away in relation to what sort of teams you want and that. Because you know, a guy picks up a bang on a Tuesday night, or her picks it up in a game or goes tight. So heavy pitch conditions, trying to get up to a level of fitness, all asks questions. But all the lads that have come in have shown they have the ability to contribute something and over another number of games, through the remainder of this month and February, we’ll get a bit more of a knowledge around what shape those lads can have within the panel." There were no new injury worries for Rochford out of Mayo's win last weekend over IT Sligo, the Crossmolina native added, and he was happy to use it to get game time into some players legs, he explained. "Keith had a bit of tiredness, it was his first proper run out, he’d a few minutes the last day [against NUIG]. It’s a case of them just returning to case. With Donal Vaughan and Lee Keegan it was a case of just getting them some time out before looking into the latter end of this month and then Cork. Mikie Sweeney pulled up with a bit of a hamstring injury against NUIG, Mikie may or may not be, he’ll be touch and go. We possibly might have Evan Regan back depending on how UUJ are. If they were to lose now this week, that make create his availablity if they are out of their competition. But as regards any other personal back it’s not expected [to be back]." Looking back on what he had learned from last weekend's game, there were plenty of positives for Rochford. "I think we definitely showed a willingness to move the ball quickly, and again we’re feeding the players bits and pieces every week trying to expand it and asking a bit more of them. I think that they by and large they went around that. Again, and we’ve said this to the players, nothing is going to be prefect in January, but it’s a work in progress and we’re happy with the element of progression from last Sunday to this Sunday," he said "[I'm] reasonably happy from the basis that we showed a good attitude to the game throughout. Taking it all in the context of second week back, difficult enough conditions from the point of view of soft under foot and a greasy ball, but I thought the lads did well. We kicked 17 scores, probably would like us to be a position to convert more of the goal chances or half chances we created, but hopefully we’ll be able to address them over the next three weeks before we go to Cork." The game in Hyde Park throws in at 2pm on Sunday, and you can catch up on all the action and reaction from it on www.advertiser.ie/mayo on Sunday evening.